Interruptions to your usual water supply can be caused by a number of reasons, anywhere from a burst main, all the way up to a contamination in the system. 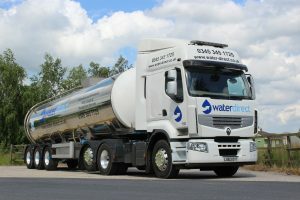 With our fleet of 10,000, 15,000 and 30,000 litre emergency tankers we can usually reach site within hours, ready with a bulk supply of clean, wholesome drinking water. Based on the situation at hand we can offer a number of solutions and our staff will be able to advise on which one is best suited to your needs. We can fill temporary storage on site or even act as a surrogate mains, injecting into the network until the interruption has been cleared. During large incidents we will often provide multiple emergency tankers, rotating on and off site for further refills to supply a continuous flow of water. We can also supply static water tanks in an emergency should there not be suitable storage on site. Along with an on demand pump these tanks can be connected straight into your system where a connection point is available. While emergency situations can’t be avoided, we do offer contingency planning which will set parameters in place to assure a guaranteed response in the case of an unexpected supply interruption where an emergency response from Water Direct is required.